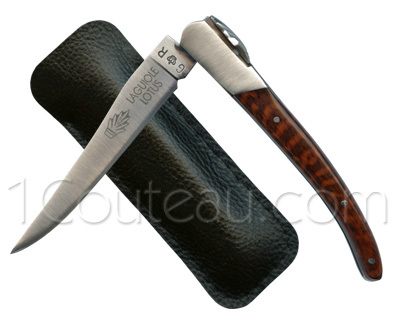 A novel creation taken from the style of early Laguiole knives. The "fly" is a technical term used by knife manufacturers designating the part of the spring that becomes compressed during the forging of the spring itself. Old Laguiole knives bear no motifs on the fly, and then knifemakers let their imagination guide them. The famous Laguiole symbol only became a bee-shaped decoration in the 50s. By using the Lotus emblem decoration, Gilles Reynewater is going back to the ideas of earlier creations. This knife is manufactured with limited series.